Contemporary, Modern Slab Executive Desks using ebony and other beautiful hardwoods. handmade natural gaboon ebony black desks. 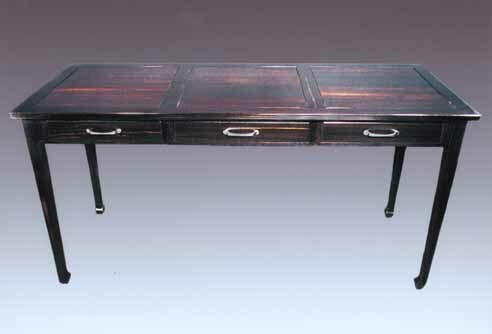 Solid Ebony black executive custom desk, three paneled top, and three drawers lined with walnut and nickel pulls. The legs are tapered slightly with an elegantly shaped foot. Handmade black desk-custom desks made in Montana and shipped worldwide.